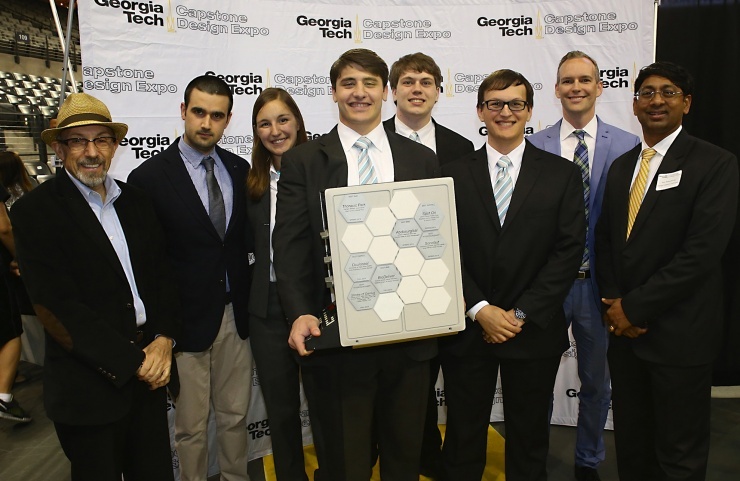 The Georgia Tech-Emory University Wallace H. Coulter Department of Biomedical Engineering (BME) team ULTra Efficient Storage won the best project award for the department at Georgia Tech’s spring 2015 Capstone Design Expo and a cash award of $1,000. The ULTra Efficient Storage team, comprised of BME seniors Nathan Fisher, Michele Mandula, Matthew Woods, and Prisco Demercurio, was supported by the Atlanta Clinical & Translational Science Institute (ACTSI), to efficiently revolutionize biological sample storage in ultra-low temperature freezers (-86 C). This ULTra Efficient Storage method will store more samples of adequate volume for modern assays in a given freezer volume and be applicable on an individual freezer basis. It will also be compatible with current laboratory equipment, freeing up lab space and funds for better use in medical research. Ultra low-temperature freezers are expensive, so this is a big cost and space saver. One of the aims of the ACTSI’s Research Technologies program is to develop and implement training programs that will supply investigators with skills and knowledge to traverse the idea path. To meet this aim the program supports the BME Capstone Design program. The program is a series of courses offered to undergraduate BME students at Georgia Tech. Students work in teams to design, build, and test prototypes with real world applications. At the end of each semester students showcase their efforts at Georgia Tech’s Capstone Design Expo and compete in design competitions such as The InVenture Prize. BME Capstone project topics are proposed by a wide variety of healthcare professionals such as physicians, nurses, emergency technicians, biomedical industry personnel, academic researchers, and patients. The course produces industry-ready professionals, complete with work skills, and technical, business, and clinical literacy. The Capstone Design courses provide seniors the opportunity to work with real-world, open-ended, interdisciplinary challenges proposed by industrial and research project sponsors. The students learn and apply the engineering design process: defining functional requirements, conceptualization, analysis, identifying risks and countermeasures, selection, and physical prototyping. Students work to solve a challenge, develop innovative tools, or work on their own dream project leading to creation of a start-up company. Georgia Tech’s Capstone Design Expo is the largest student design expo in the U.S. It is an opportunity for student teams to present their innovative ideas to solve real-world problems to industry, investors, and the general public. “I want to thank the ACTSI for support of our Capstone program. BME has a spectacular showing each year, winning in all categories that we competed in over the last three years,” said James Rains, Director of Capstone, Wallace H. Coulter Department of Biomedical Engineering, Georgia Tech and Emory University.